I’m looking forward to hear what you have to say about the swine flu with kids. I’m sure you have real reason to hide in your house, but I live in Costa Rica and we have 2 cases, who are both fine by the way, and some of my friends are running to tiny villages to hide. It’s like out of control! Hoping you guys stay healthy. Truly some amazing sightings on your recent trip. 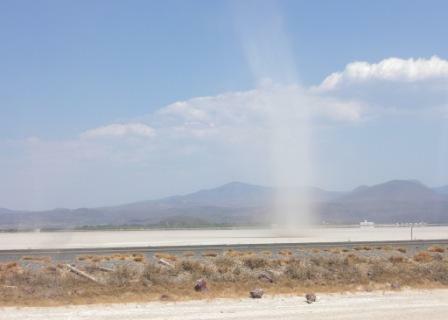 I’ve never seen or even heard of dust devils before…wow! I am just starting your book and already really enjoying it. i hope that you guys are ok, health-wise. what incredible photos!! @Marina you’re right, everything’s a little over-the-top wrt swine flu. But, my nurse friend recommended that we avoid social contact for a couple of days just to be on the safe side. Since we went through two major airports, we couldn’t be sure we hadn’t been exposed. @Lucia and @jessiev Glad you enjoyed the photos! You’re right, but you have good reason! Some people are walking around here in Costa Rica, with masks on just for a show. 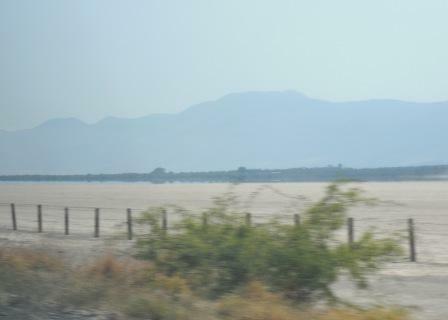 This is is great scenery, and what kid wouldn’t love those dust devils. Hope you all stay healthy. And you’re right it has been very interesting watching this whole thing unfold. I’m still processing how I feel about people’s reactions to it. (oh, and I think it’s wise to stay home, as a teacher, I thank you for that!). Yikes – talk about timing! The locals are all wearing surgical masks here and the scars of SARS are still fresh in the memories – fingers crossed it all passes soon! I appreciate the tradition of a ‘down day’ after traveling. Having some time to regroup is important to us too, and helps us digest the trip without getting caught up too quickly in life’s natural whirlwind. Hoping that your travels ended safely as well! Looking forward to reading more about your trip.